As we reflect on 2018 and begin to chart a course for the new year, we find that our ruminations are bringing us to a crossroads. On the one hand, we are currently enjoying a low unemployment rate, the likes of which our country has not seen in 50 years. On the other hand, many experts believe that a recession is looming on the horizon. With two potential paths to take—one of optimism, and one of caution—which one should economic developers, and the communities they serve, follow? While every community’s situation is unique, experience tells us that the prudent path to take, both in times of full employment and in eras of economic downturn, is one of proactive strategic workforce development. We know that even prosperous conditions for employers can quickly go south, leaving communities in the lurch if they lack a plan to meet evolving workforce needs. In particular, we know that the development and implementation of inclusive strategies—those that ensure no one is left behind either in times of decline or during rebounds—is vital for keeping diverse communities thriving. In the year to come we look forward to blazing ahead on a third path of our own creation, one that balances optimism with forward-looking approaches to economic development that will help our partners through uncertain times, come what may. In December, CAEL announced a request for applications (RFA) to join the inaugural cohort of the Inclusive Development Network. As you know, the economic development field is poised to take a more proactive, forward-facing approach to workforce development and inclusive strategies to ensure that communities are creating education, job and career opportunities for all residents. To that end, five (5) communities—each anchored by a lead economic development applicant—will be selected to participate in the inaugural Inclusive Development Network. To learn more about this opportunity, visit https://inclusivedevelopmentnetwork.org or click the button below. All applications are due by Thursday, January 31, at 5 p.m. CST to IDNetwork@CAEL.org. After reviewing the applications, we will announce the five selected communities by March 1. Exciting synergies are on the horizon for workforce development in the Birmingham, Alabama, region, and CAEL has enthusiastically joined dedicated partners in the region to help develop a targeted workforce alignment strategy. In December, CAEL joined dedicated local organizations, including the Workforce Action Network, the Birmingham Business Alliance and other groups supporting the state's Success Plus initiative to further enhance activity in the region spurred by the recent report "Building (it) Together." As CAEL joins this work, we'll help regional entities enhance talent attraction and retention, and together, we'll place particular emphasis on inclusive economic growth with an eye toward equity. The project's strategies and tactics are designed to address issues related to access and affordability. This project will roll out over three phases. We've already begun work on the first two phases, including the development of a leadership council that incorporates a diversity of perspectives and organizations from across the region. Early phases of the project also focus on gathering information, producing an inventory of available education assets, and overall project management and client communication. Implementation is scheduled to run through May 2019. The region is taking notice of the strides our partners are making. Waymond Jackson of the Birmingham Business Alliance and Antiqua Cleggett of Central Six Alabama were named among "30 People to Watch in Birmingham Business in 2019" by Birmingham Business Journal. Here are a handful of upcoming workforce and economic events that may interest you. Will you be attending any of these events? Let us know! There’s no way around it: To meet the rapidly evolving needs of today’s businesses and strengthen our nation’s workforce, it’s vital that adults have access to continued training and education opportunities. Increasingly, employers are rightly recognizing that regional colleges and universities are not only a source of potential future employees, but also places to provide upskilling opportunities for current employees. Likewise, higher education institutions, facing nationwide flagging enrollment rates from so-called traditional students, realize that they must reach into previously untapped demographics of potential students, such as working adults. Of course, it’s not enough to merely bring stakeholders that represent both of these sides to the table. That’s why institutions around the country are employing both new and familiar strategies to link learning and work. Late last year, the Federal Reserve System’s Investing in America's Workforce initiative released a three-volume book series, titled “Investing in America's Workforce: Improving Outcomes for Workers and Employers.” The series, which was made available for free download and can be found here, combines analysis on how to create more effective workforce and economic development strategies from more than 100 contributors. One such contributor was Wilson Finch, CAEL’s director of higher education services for workforce and economic development. His contribution, “Activating Prior Knowledge and Acquiring New Skills,” provides a thoughtful overview of the methods of learning that are suited to adult students’ unique needs and attributes—like prior learning assessment (PLA) and competency-based education (CBE)—and it also shares examples of employers, industry associations, chambers of commerce and higher education institutions coming together to build effective learning opportunities for adults. "The deficit of skilled workers is being exacerbated by three tendencies within industry and education: 1) neglecting to eﬀectively engage substantial proportions of potential workers (particularly adults and nontraditional learners) in eﬀorts to combat the deficit, 2) failing to adequately capture and validate existing learning possessed by those workers and apply it to their current and future jobs, and 3) inadequately aligning credentialing outcomes with the verifiable needs of employers, workforce and economic development goals, and industry sectors." To read “Activating Prior Knowledge and Acquiring New Skills,” click the button below or click here. In November, CAEL's Jade Arn, director of workforce and economic development, spoke with ECMC Foundation to discuss CAEL's progress with a two-year study to determine ways to effectively increase the adult learner pipeline into postsecondary education in four selected sites. In her conversation, Arn details the tremendous opportunity PLA gives to higher education and workforce stakeholders in encouraging adult postsecondary educational attainment. To read the ECMC Foundation Q&A, click here. To download the recently released paper that highlights results from that study, Linking Public Workforce Systems and Community Colleges through Prior Learning Assessment, click on the image below. In October, the National Association of Workforce Boards (NAWB) hosted a webinar led by CAEL's Jade Arn, "Prior Learning Assessment: Impact and Implementation," that provided another affirmation of the value and effectiveness of PLA as a learning strategy to encourage employee upskilling. 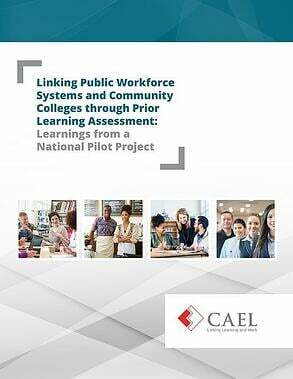 The webinar featured an overview of the ECMC Foundation-funded PLA white paper CAEL developed in partnership with NAWB, "Examination of Prior Learning Assessment (PLA) As Strategy for Achieving Workforce Development System Success." Both the webinar and the report that informed it provide an overview of PLA, details about how a workforce board has used PLA and information concerning what the future of PLA may look like in the context of workforce and economic development. For anyone interested in learning more about PLA, watching the webinar is worth your time. To view a recording of the webinar, click the button below or click here.